At first I was fairly certain it was one of the purple leafed basils, maybe 'African Blue'. It's fairly impossible to find it still thriving in a Texas January, but two plants in my yard are still hanging in there. They even look like they'll come back if we don't have a deep freeze before spring. 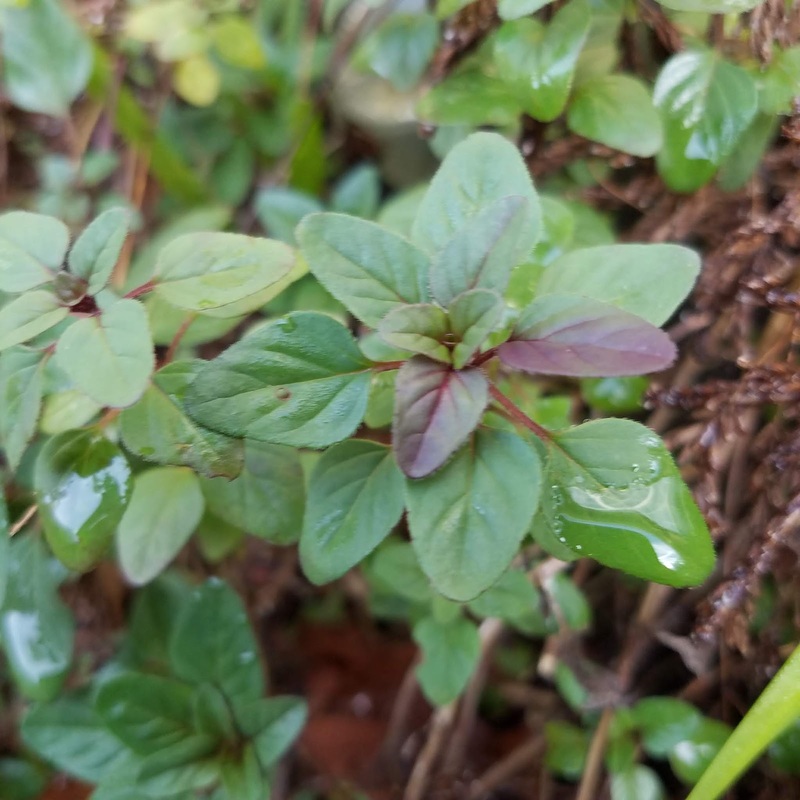 BTW, this basil has one heck of a botanical moniker - Ocimum kilimandscharicum × basilicum 'Dark Opal'. Guess that's why we stick with 'African Blue'. It's a sterile plant, meaning those blooms that attract hordes of bees will never produce seed. Propagation is only by stem cuttings, or survival by backyard miracles where they somehow manage to overwinter. Several people thought her plant might be "that purple beebalm" - which I suspect is Monarda 'Peter's Purple'. It wouldn't be my guess due to its growth habit and leaf shape, but I posted a picture below for comparison. It does manage to survive, even thrive, in mild winters. An extended freeze will kill it to the ground, but this survivor will pop back up in spring - everywhere. 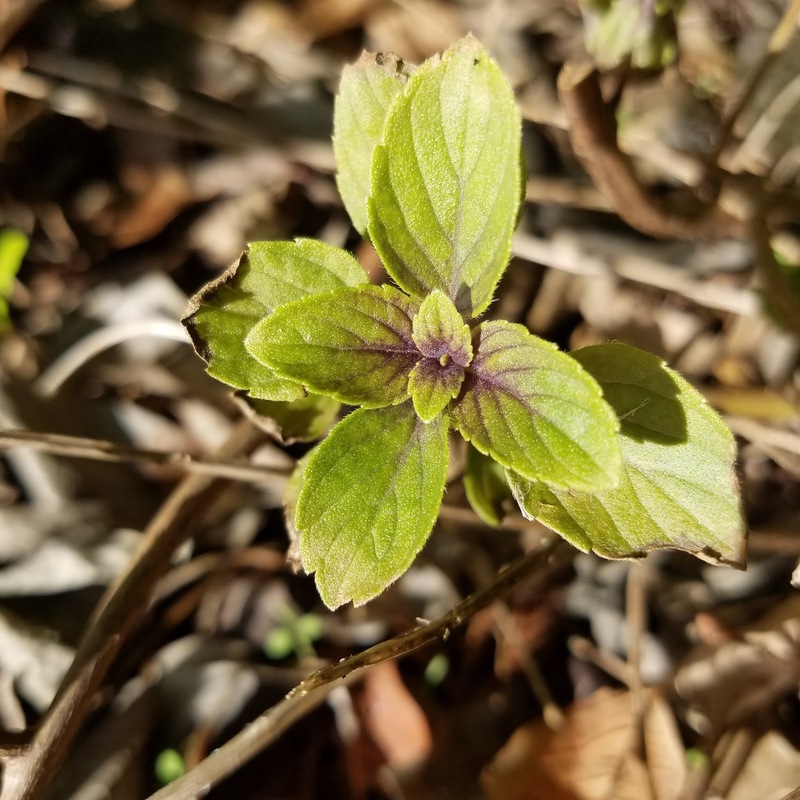 Many members of the genus Monarda struggle with mildew in our hot summers. This guy developed quite a following over the past few years as it can grow vigorously and disease-free to the point of becoming a bit of a garden thug. This is the one I think our mystery plant most resembles - Originum laevigatum 'Hopley's Purple'. The undersides of the leaves show a lot more purple than this picture reflects, but the leaf points are also more rounded than the mystery plant. She said it smelled like thyme when the leaves were crushed, and this ornamental oregano doesn't really smell like thyme no matter how many leaves I smash and sniff. It features unique flowers sticking up on tall stems above the low mounding plant, but no flowers this time of year. Bottom line, my best guess is that our mystery plant is one of the ornamental originum, even if it's not 'Hopley's'. One problem with online identification in winter is that you can only get so far without blooms or the option to bruise and sniff a leaf. That it was still growing well in January, albeit after an unusually mild winter, would normally rule out any basils. Not this year, as evidenced by my African Blue still sporting quite a few healthy leaves. 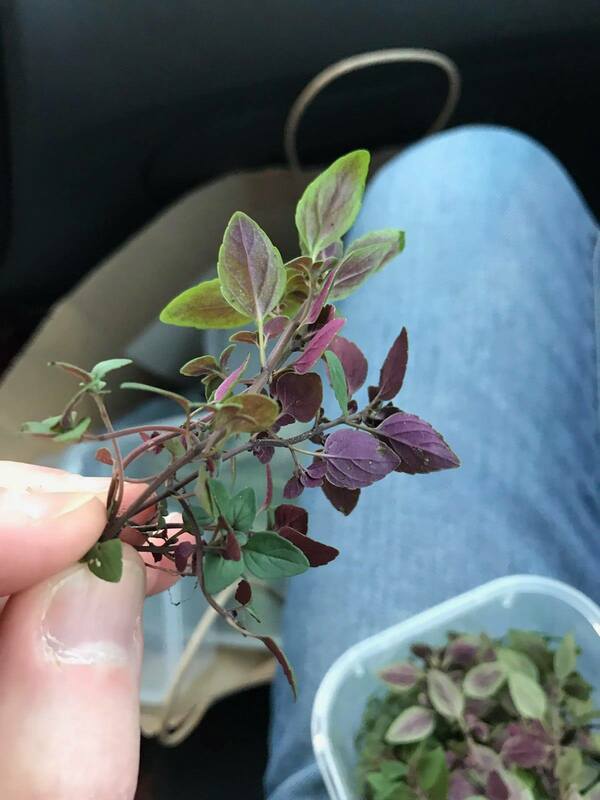 And while winter cold can create a purple tinge on plants that don't normally sport it, cold wouldn't color the entire bottom of a leaf surface while the top remains primarily green. The purple coloration in this Bicolor Sage (Salvia sinaloensis 'Bicolor') is a year around attribute, but even that hue deepens after winter's frost. 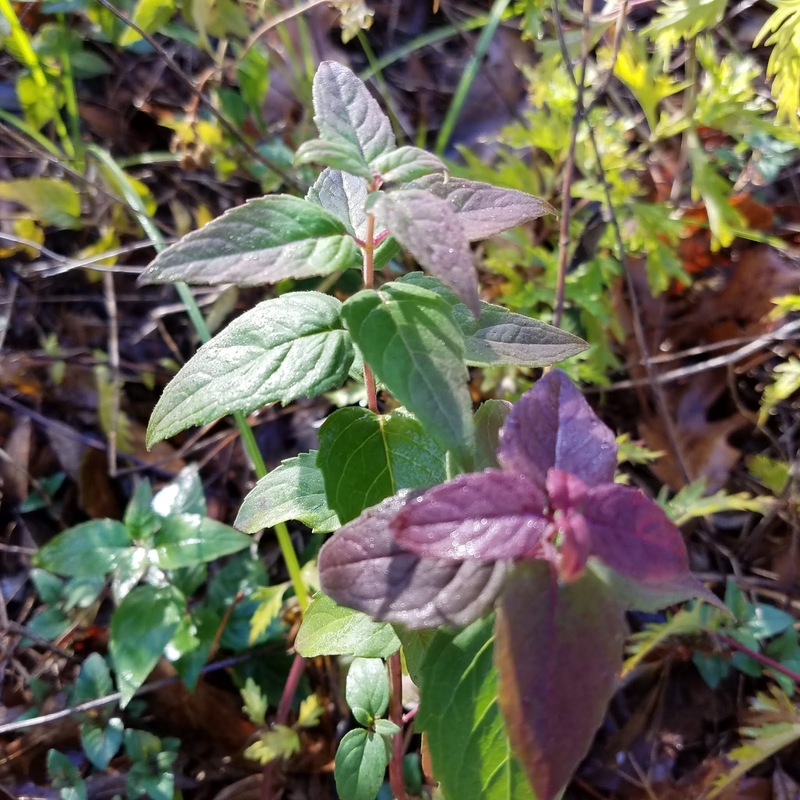 These seem like wildly different plants, but they're all members of the same family, Lamiaceae, commonly called the mint family. 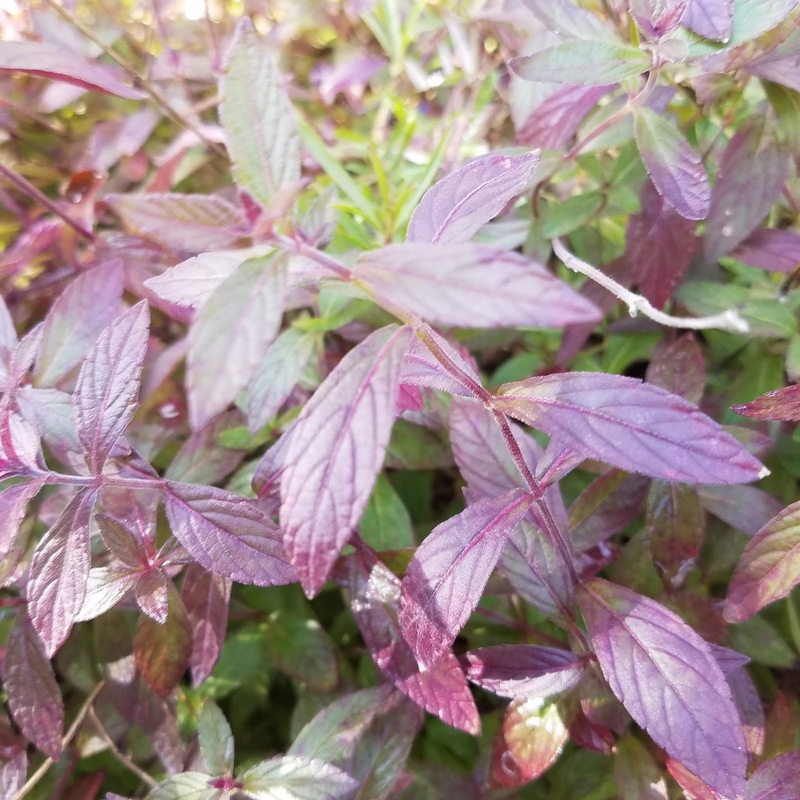 It includes the genera Monarda, Originum, and Ocimum, meaning all the guesses were actually in the same family. They all have "square" stems. They all have similar shades of green and purple while being wildly different. Sort of reminds me of cousins. Which in an crazy way prompts me to mention I just found two of mine after more than 60 years. Cause for celebration and reflection, but clearly unrelated to identification of our mystery. Thanks for humoring me while I mentioned it. Back to the first plant above which looks VERY familiar, but still isn't identified to my satisfaction. Would any of you gardeners care to help? All material © 2019 by Vicki Blachman for Playin' Outside. Unauthorized reproduction prohibited.